What content were you reading this year? Did it include some of the most shared articles of 2015? We think it’s possible to reverse-engineer heavily shared content to help us learn to make things go viral in the future. Why does certain content get shared so much and go viral? Last year we looked at 100m posts and highlighted the common characteristics of viral content. This year we added over 1 billion articles to our content database and looked again at the most shared posts. Our analysis shows that viral posts remain outliers, and unfortunately there is no magic formula to go viral. However, there are insights from viral content that we can use to improve the shareability and engagement of our own content. The posts we are looking at in this review are primarily consumer posts, we have previously examined the best B2B posts of 2015. Below we have provided examples of the most shared posts of 2015 and tried to break down why they went viral. If you haven’t got time to review them individually, you can jump straight to our conclusions. Our review has identified four different elements which occur frequently with viral content. A combination of these elements may not guarantee viral success but they can improve shareability. Look out for these elements in each of the viral posts below. Viral posts are not the norm. Our examples below include posts with millions of shares. However, these viral posts are exceptional even for very largest viral sites, as we can see from the graphs below. 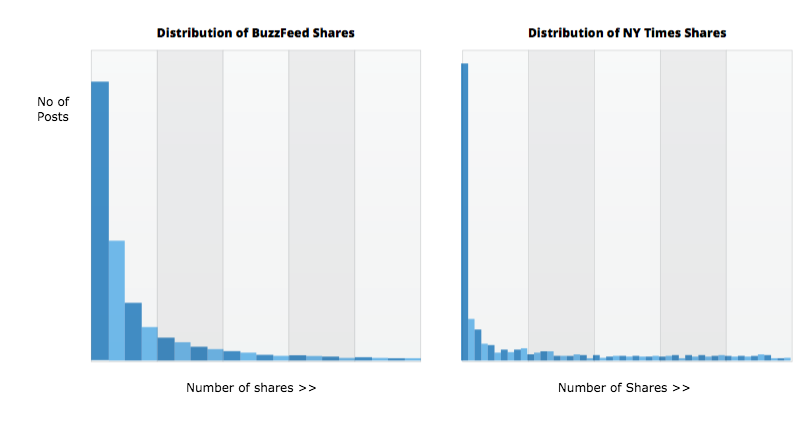 These show the distribution of shares across posts for BuzzFeed and the New York Times. There are fewer and fewer posts as the numbers of shares increase. Going viral is like alchemy, and even the best sites cannot consistently replicate the success of their top posts (if they could, they would). Like most publishers, the top sites have a lot of steady performing content and a few huge hits. The top three most shared articles on the Huffington Post demonstrate this quite clearly as we can see below. The top post got almost double the shares of the third most shared post. This is a pattern we see again and again. Thus viral posts are exceptional, and there is no simple formula for viral success–unless possibly you are an international celebrity. For our analysis we excluded content about and from celebrities, musicians and films, even though they can drive huge volumes of traffic. 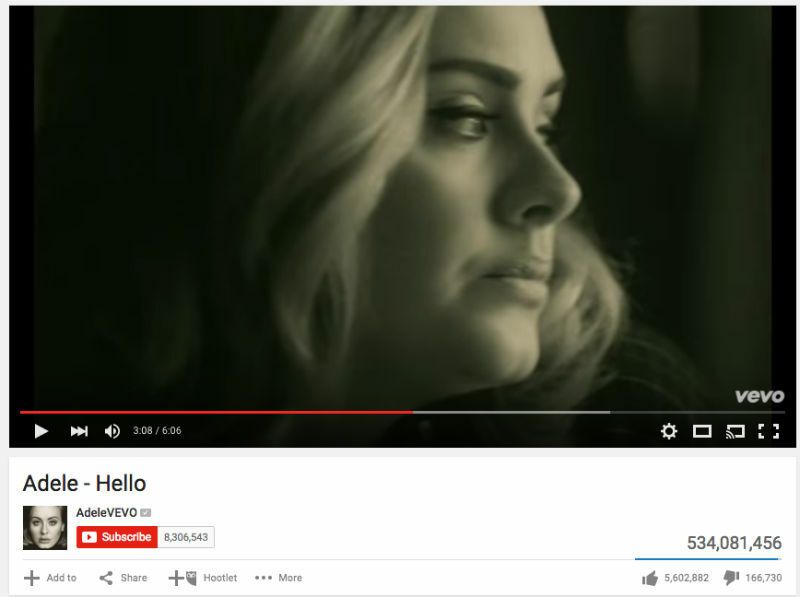 For example, Adele’s recent release of her song Helllo on YouTube raced quickly past 500m views. What if you’re not Adele? (and If you are Adele: Hello, how are you, please feel free to share this post). What can you do to create more shareable content? In our view these viral posts provide insights into how we might make our own content more shareable, even if it doesn’t go viral. Here are our lessons from the most shared content of 2015. People like to share content–both facts and images–that surprises. They also love to share new research and trends, particularly if they challenge current perceptions. Marketo’s 2013 survey with Brian Carter on why people share on Facebook found that people love to share amazing and surprising content. This view is supported by our review of 2015’s most shared content. The most shared content on the London Evening Standard site this year was a post that probably made many of us happy. 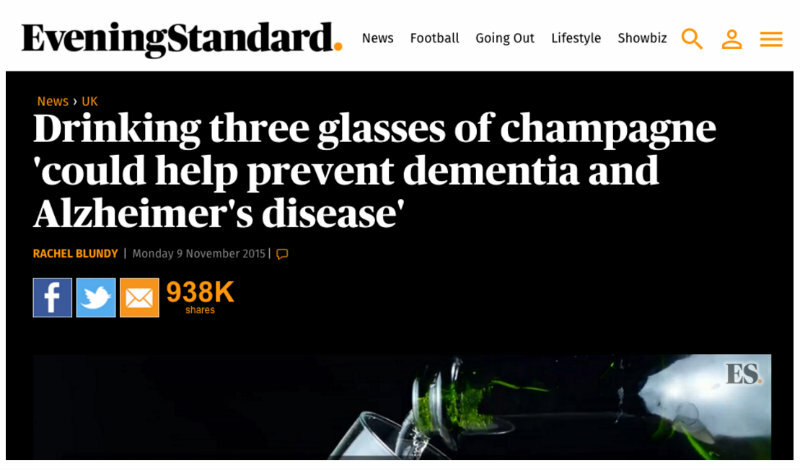 It highlighted new research showing that champagne can help prevent dementia and Alzheimer’s Disease. Very welcome news at Christmas. Cheers! The most shared article on Huffington Post this year was also surprising. It combined research with a provocative title. The post was about addiction, a current topic of discussion and interest. The post highlighted new research challenging the prevailing wisdom about addiction and highlighted the significance of isolation and loneliness. The post was clearly thought-provoking and made people keen to share. This post went viral on Facebook as we can see below. In most cases we found Facebook was the key network in igniting and driving viral content. A subset of surprising facts is new research and trends. The latest slides from Mary Meeker on Internet Trends are a good example of highly shared B2B content with nearly 3m views. It also helps that they’re in Slideshare format which makes them easy to digest — much easier than a dense report. 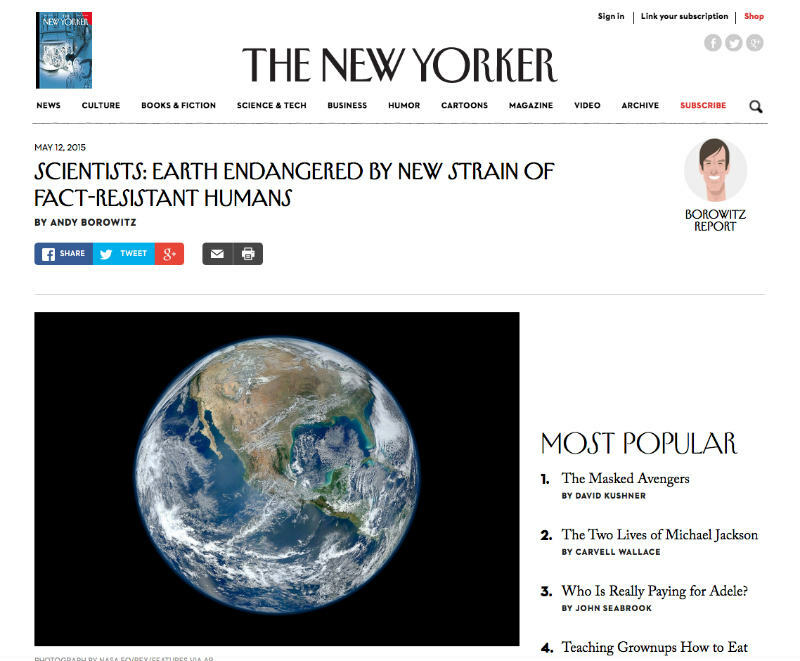 Viral Elements – Surprising content backed by research, provocative titles and easy to scan formats. We all know that the trend is our friend. Commenting on, or including, in-vogue topics in your content can increase engagement with your audience. In 2015, if in doubt about popular topics, write a Zombie story. This is an example we would not normally predict to go viral. 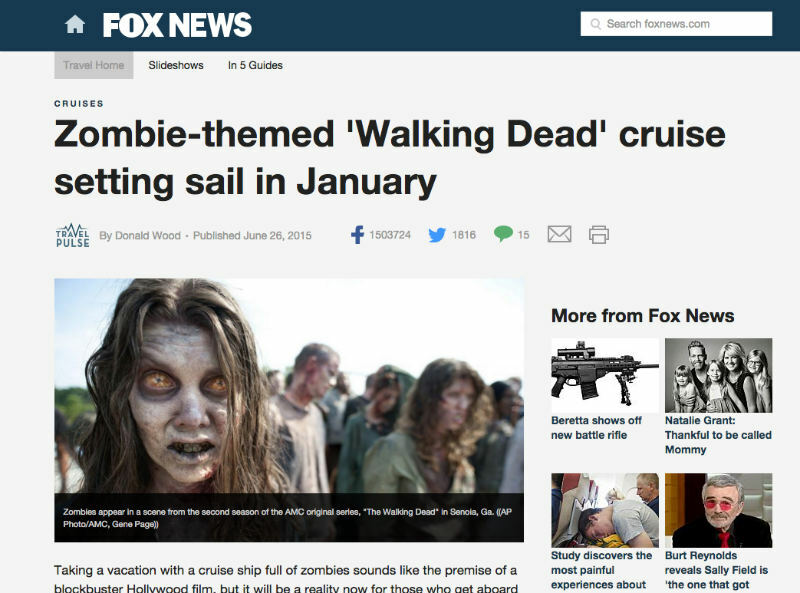 It is simply an article about a Zombie-themed cruise; however, the reaction was huge. The post got over 400,000 comments. Yep, that is 400,000 comments. It was fun and very much on trend. Who would have thought that Zombies would be viral? Fox news is a popular site, but this post dominated their other most shared content. It got almost five times the shares of their next most popular articles, demonstrating again that viral posts are outliers. Fox was not able to reproduce this level of sharing with any other posts or even come close to it. Viral elements: Content about a popular topic or trend. But remember that there’s no guarantee. Inspirational quotes, including images with inspiring text, have become a very popular form of content on the internet. Insipiring content can take many forms, including stories like those below, but there seems to be no shortage of appetite for inspirational quotes. BuzzFeed remains the master of the curated viral list post. 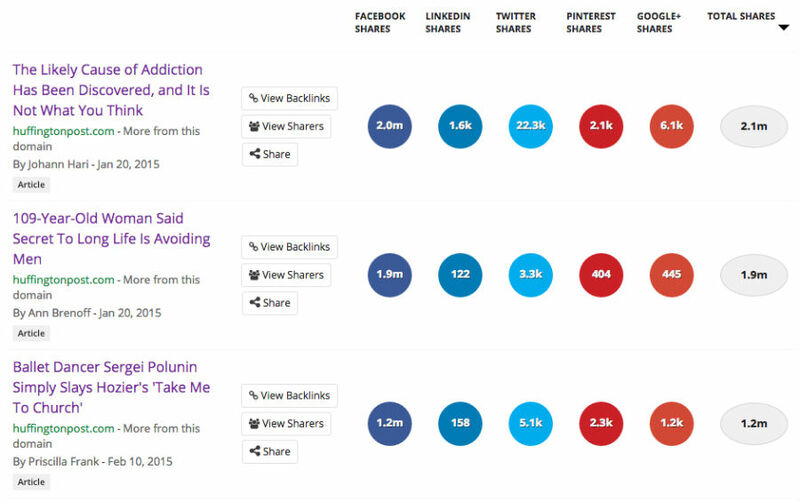 We hate to admit it, but list posts remain one of the most shareable forms of content. 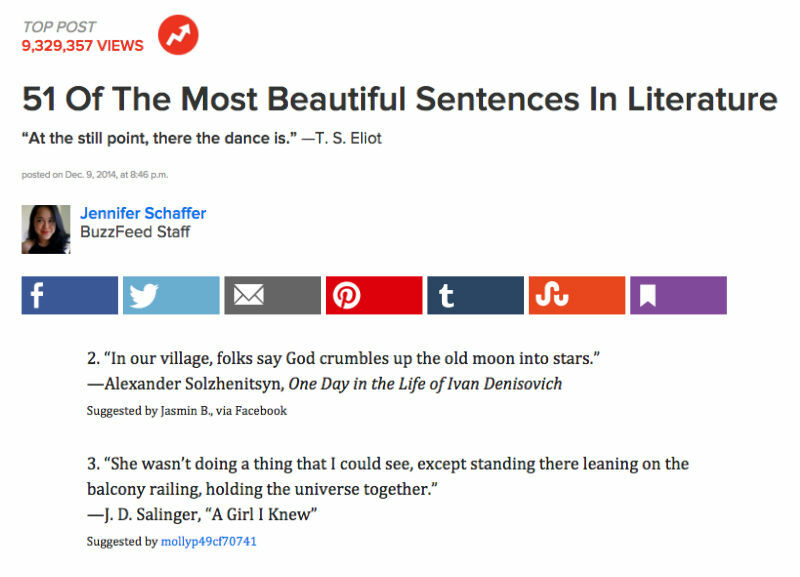 This curation of 51 beautiful literature quotes had over 9m views and over 1.4m shares. Most people have favourite books and quotes. We have previously identified picture list posts as an ideal format for viral content. Images are very powerful on the internet and picture list posts enhance this power with the shareability of curation and list posts. This was the 4th most shared post on the New York Times this year and achieved over 500k shares. It is a list post with beautiful pictures that appeals to the love of travel and adventure. Beautiful images are inherently shareable but photos do not need to be of beautiful things. 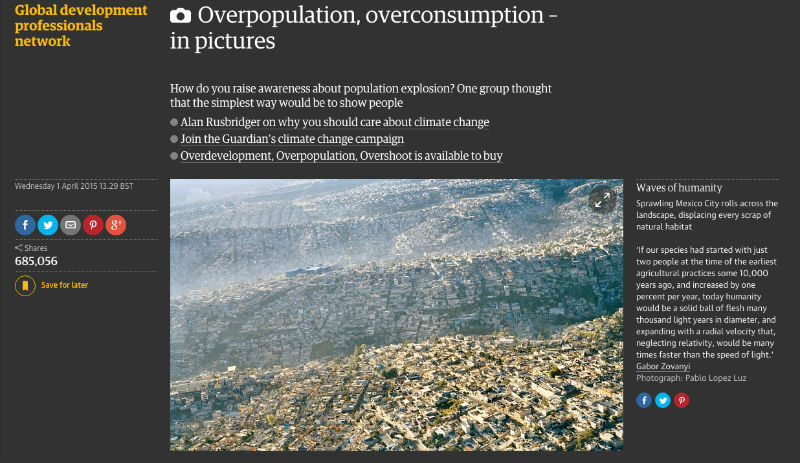 This series of images on The Guardian demonstrated much that is ugly about the world but did so using very high quality surprising images. Like the earlier example, the post is very surprising, thought-provoking, and visually rich – key viral elements. This article was the second most shared post on the Guardian this year. Viral elements: Visually rich posts with awe-inspiring graphics, and curated list posts. Yes, you read that right. Cat posts have become cliche on the internet. Dress a cute cat in a Halloween outfit and you have the makings of a very shareable post. It is not only cats, other pets and babies do equally well. We took this example from Gizmodo. 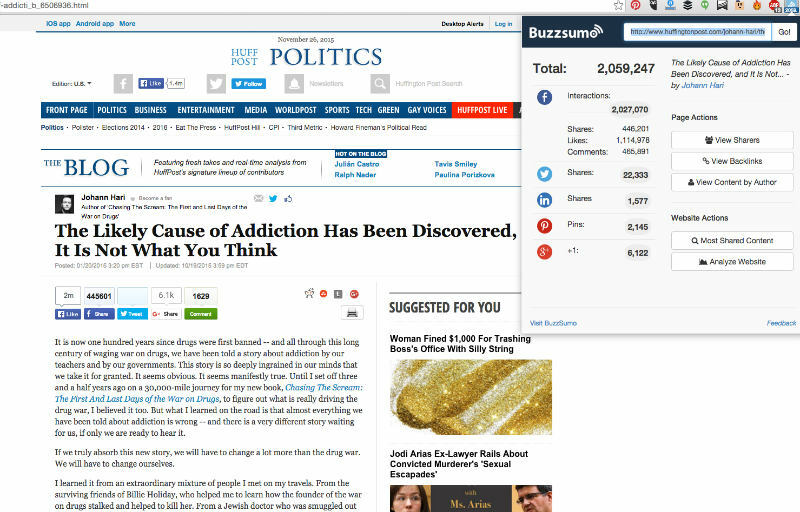 You might expect to see cat posts do well on big viral sites such as BuzzFeed, but less so on sites such as Gizmodo. However, Gizmodo’s top post this year by some margin was about pets. The post received over 680,000 shares. Babies are also a good substitute for pets, or is that the other way around? Viral elements: Cats, dogs, pets and babies. 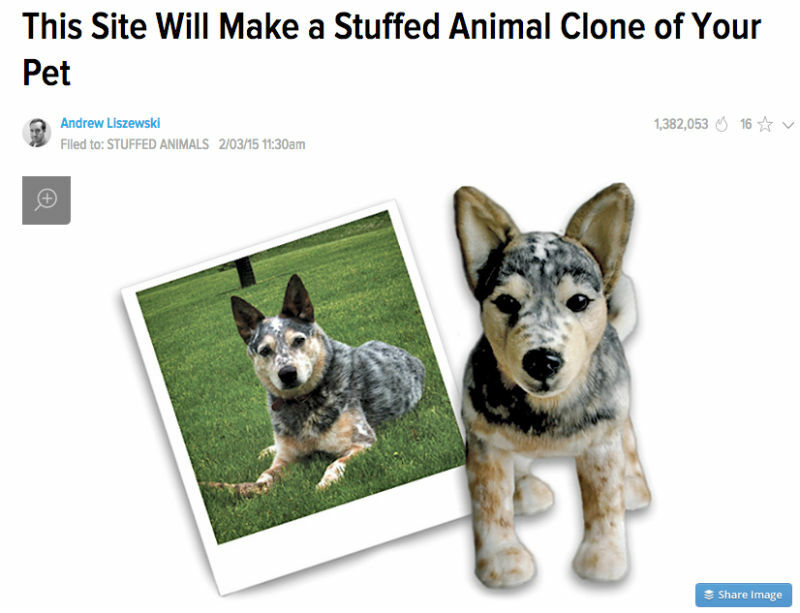 The Gizmodo post was also surprising, or maybe not if you are a pet lover. People like to share entertaining content. A study by the New York Times found one of the most common reasons people share content is to bring valuable entertaining content to other friends. Make ’em laugh, and you’re on your way to going viral. For example, this amusing post on the New Yorker got twice as many shares as any other post on the site this year. It may have also tapped into a trend about people questioning scientific evidence. People love to share amusing videos, and video is a fast growing format on Facebook. 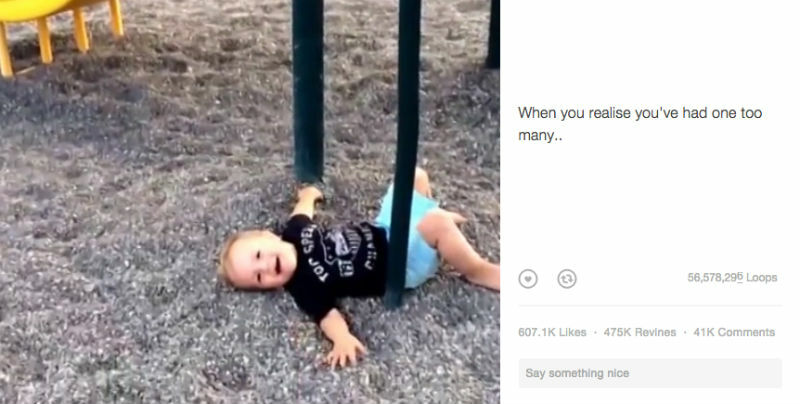 This short video was one of the top Vines this year with over 56m loops. 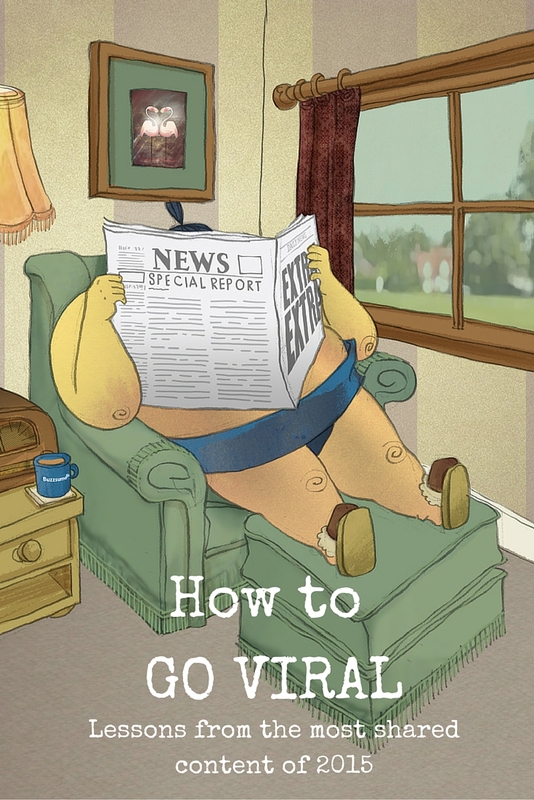 Viral elements: Amusing posts and videos. Our first example leveraged a current issue whilst the second leveraged a cute kid. Controversy engages people though it carries a degree of risk. By nature controversial posts can be divisive. However, people often share to be part of a tribe supporting a particular view and to show their loyalty or belonging. We had a look at the Facebook posts of Donald Trump and filtered out those with the most engagement using our Facebook Analyzer tool. Donald Trump may be divisive, but he has engaged a tribe with similar views through his posts. If we look at the likes and shares of posts on Donald Trump’s Facebook page over the last 6 months, we can see that his controversial statements have driven a relatively high level of interaction on Facebook, and it’s growing. Viral elements: Controversial opinions about trending topics. If you find your tribe, and it’s big enough, then they’ll help you go viral. People love a quiz, particularly if it tells them something about themselves. People also like interactive content which they can share with friends, for example a popular UK quiz was How Northern Are you? Most successful quizzes encourage users to share the quiz and their result immediately upon completion. This works especially well if the result portrays you in a positive light. This personality quiz was the second most shared post on PlayBuzz this year with almost 4m shares. The top post was another quiz ‘Can We Guess The Level of your Education?‘. PlayBuzz has become a master of the viral quiz, and if you haven’t already studied their viral content, it is definitely worth a look. This post was a classic example of viral Facebook content. It drew you in from the very first screen and appealed to your instinct to test yourself. It was also something people wanted to share, as demonstrated by almost 5m shares. Sharing your percentile score (assuming you did ok) also makes it appealing. This post exploded on Facebook, and its reach was out of all proportion to shares of other content from the same site as shown below. The site has subsequently run a number of quizzes but created nothing to match the success of this first post. That’s a side lesson–you can’t just re-run what worked and be assured a second viral result. Content formats can get old quickly. Interactive content is a variation on quizzes and can also do very well, as we will see with this next post. The most shared post on Time this year was on the most popular baby names. You simply enter you name and year of birth, and the site calculates what your name would be now or in other decades based on the popularity of your name when you were born. This article also made it very easy to share your results with your friends on Facebook or Twitter. Viral element: Easy-to-take quizzes that highlight something about the user. Interactive content formats and encouragement of sharing. The 2014 Marketo and Brian Carter research found that people shared content to provide warnings to other people about dangers such as a scam. This continues to be the case in 2015 as we found a number of most shared posts that were warnings. The most shared post of Webmd.com this year was a warning about a recall which had four times as many shares as other posts on the site. Interestingly there was other warning content at Webmd, but the Tylenol post was particularly viral. Viral element: Timely warnings or cautions in your field could win you an audience as it’s helpful content to share. Most people want to be successful. People also like to share content that is valuable or helpful to others. Thus posts designed to help people achieve success have the potential to go viral, if the content delivers. This is our first B2B example, which was one of the top shared posts on LinkedIn this year. It’s had over 3.6m views on LinkedIn. 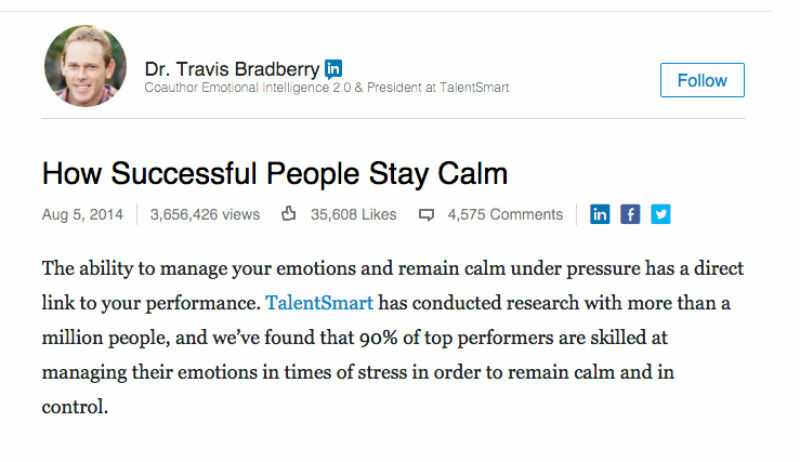 Based on our look at content that performs well on LinkedIn, it’s clear that the word “successful” in the title helps. This particular title also taps into the current trend and interest in mindfulness. Viral elements: Tips on being successful, practical, helpful content and leveraging the current interest in Mindfulness. Who doesn’t want to get healthier? Health was a popular topic in 2015. 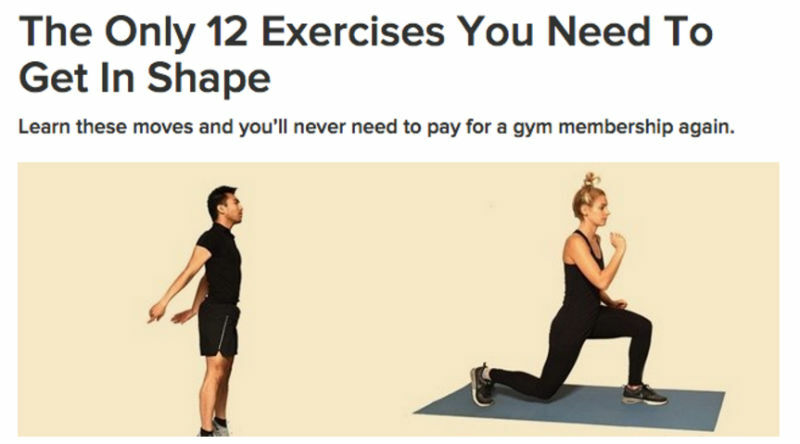 Interestingly, three of the most shared posts on BuzzFeed this year were about health, as seen below. This post appealed not only to a desire to be healthy but also to your budget. One noticeable feature was that the post included individual images that were sized and ready for Pinterest. The post was pinned over 500,000 times. Viral elements: Health, diet and fitness tips. Good use of imagery, a form of picture list post, how-to posts that will help people improve themselves. Love is the drug, as Bryan Ferry put it, and it appears that the right content on love or dating has a lot of potential to go viral. 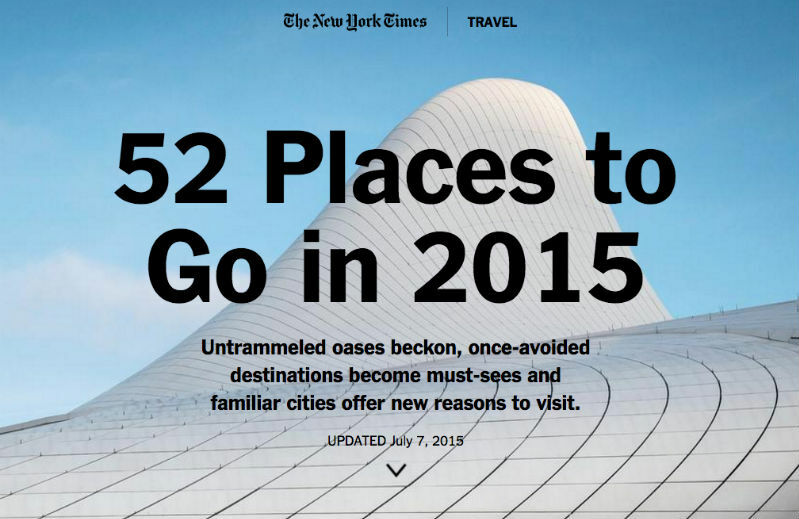 The most shared posts on the New York Times this year are outliers, gaining a lot more shares than other posts, and most of these articles are arguably not news. 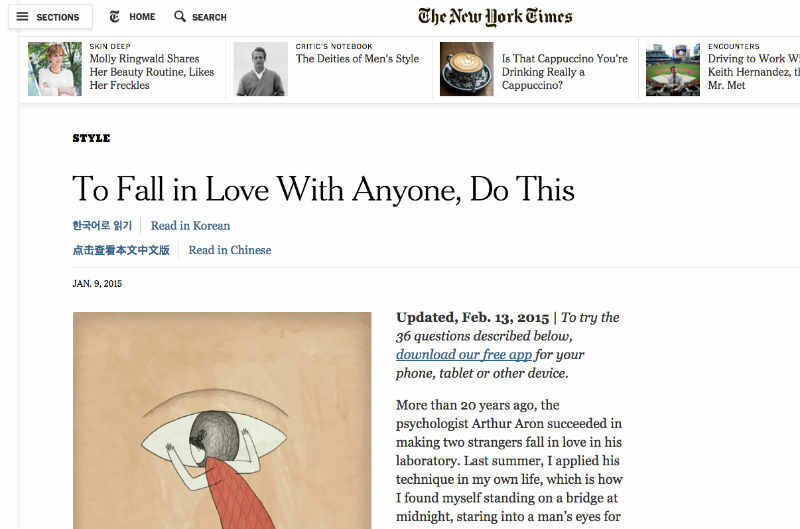 The second most shared post on the new York Times caught our attention about falling in love. The post challenged a common preconception about love, as it says you can can fall in love with anyone–not just your soulmate. This post got significantly more shares than the 3rd and 4th most shared posts on the New York Times and almost double the 5th most shared. It is also a form of “how to” post, and has a great headline that you can’t not love. This is a variation on the theme of love and soumates. This post resonated with the audience and was the most shared post on Thoughtcatalog.com this year by some margin with over 1.6m shares. Viral elements: Insights into love and dating. Great headlines and one was also a ‘how to’ post that had an interesting claim. The cause of existential angst, according to Sarte, is knowing we are going to die. He also said “hell is other people,” so he probably wasn’t on Facebook. Whether you agree with him or not, it seems we are all keen to find ways to avoid an early grave. This video post was the second most shared article on the Huffington Post this year. In some ways it is an expert interview post as Jessie Gallan has turned 109, but it is also a fun and happy post celebrating long life. 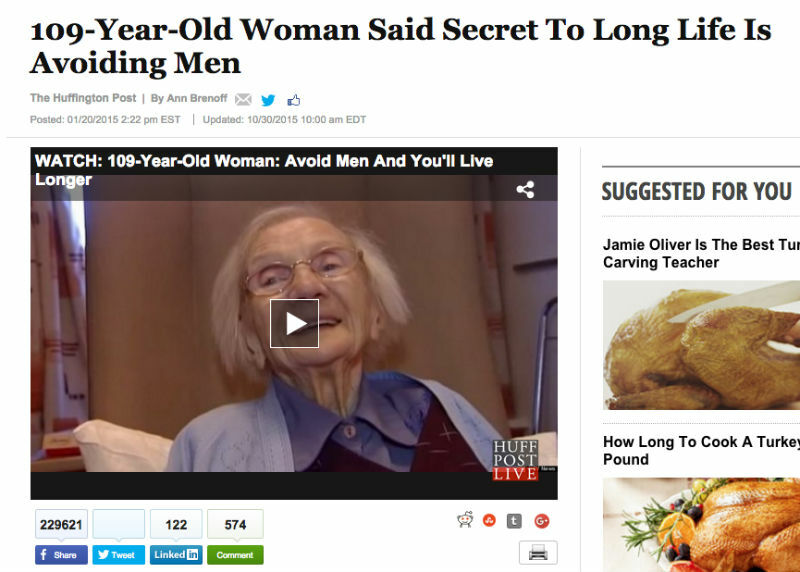 Jessie puts her long life down to walking, a bowl of porridge each morning, but primarily to avoiding men. However, this may not be the only answer to a long life, as we shall see with our next example below. Viral elements: Share the secret of eternal life. Or if that’s too much of a stretch, share heartwarming content about longevity. In a way this is a variation on how-to health posts. People love stories and they love to share heart warming stories. 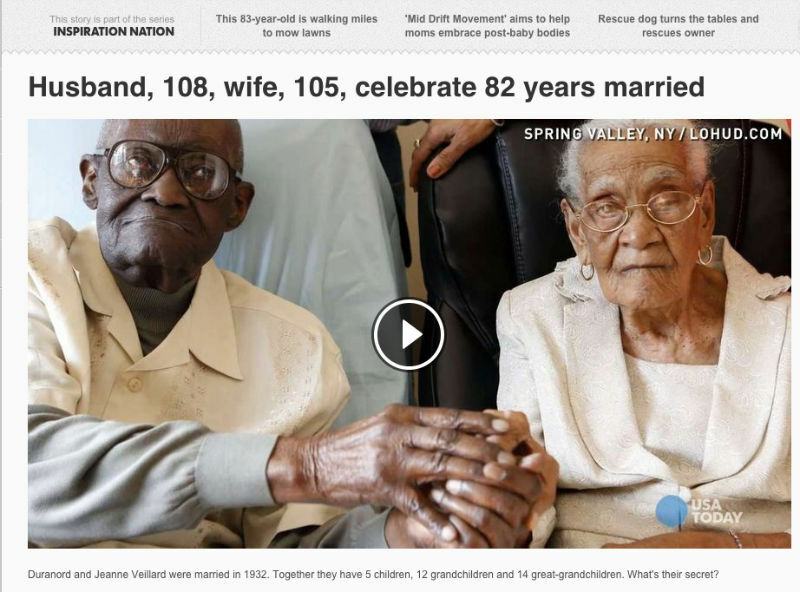 USA Today’s top post this year was a heart warming story of a long and happy marriage. Maybe the moral for men who want to live a long time is to be married. This post topped USA Today’s most shared content because it was a heartwarming, happy, inspirational story. It may also have some insights for long life as the couple describes their healthy breakfast of tea, oatmeal and fresh fruit. They also nap early and often. Viral elements: This post contained a happy story of a long marriage and possibly the secrets of a long life. Ok, so what have we learnt from the most shared content this year? More importantly can it help us in creating shareable content? It is worth starting by reiterating that there is no formula for going viral. It’s not always clear what will ignite a post and provoke significant sharing. Even the big sites have random outliers, posts that generate share counts no one could have predicted. The evidence also suggests it is not simply about the content but also about amplification. 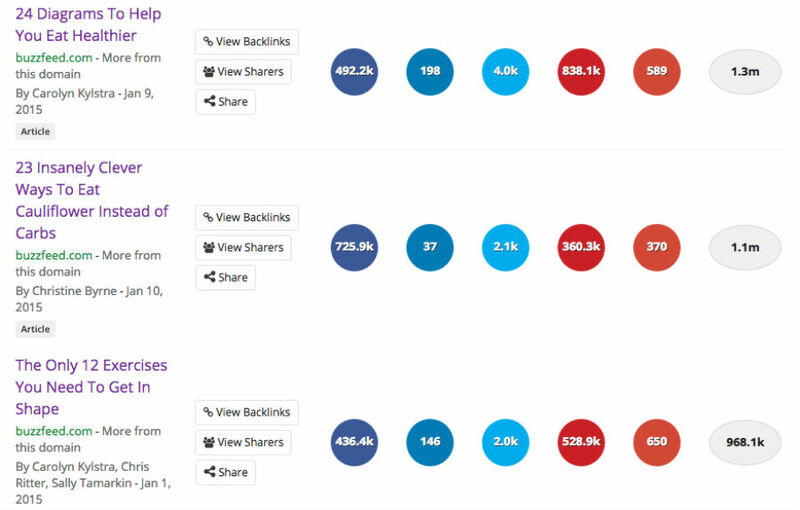 In our research sharing by just 5 influencers can be enough to ignite content sharing. Paid amplification can also help kick start things if you have a potential viral post. 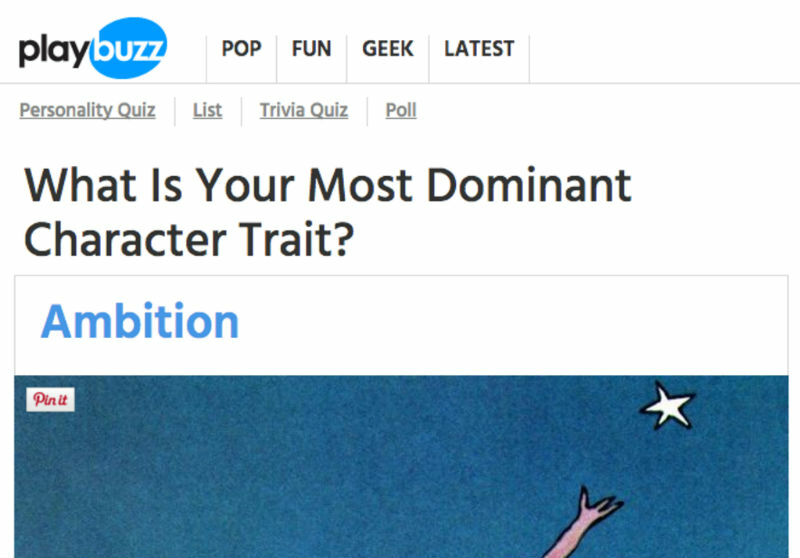 A quiz on a popular topic leverages both a trend and a shareable content format. A picture list post combines three very shareable elements namely a list, curation and images. From our analysis there are four different elements that contribute to shareability as follows. Does the content have an emotional element? Does the post include shareable content types, such as facts, images, and quotes? Is the topic one that resonates with your audience? Is it trending? Is the format one that works well with your audience, such as practical tips or a quiz? Thus a simple headline using all four elements may be “10 surprising facts about Zombies”. Ok, so you can’t just write by numbers like this, but it’s a good way to check that your headline will have shareability. Can you go viral in 2016? .. by learning the lessons from this year’s viral content we may be able to make our content more shareable in 2016. Thank you very useful information. As I read I had ideas starting to germinate in my mind and now have starting points for brain storming content ideas for my clients. Just tweeted to my followers. I’ll share it on Facebook shortly. Keep up the great work, Steven. Hope you have a great Wednesday! Good grief. You hit it out of the park again. Great, great content. Hi Mandy, thanks. It is really good to know the research is appreciated. Planning some more studies early in the new year. Nice Piece of content. Got to know many facts about how to make content viral on social media. I will going to apply some of it soon. Hi Andrew, thanks, I think that is a valid observation. Mark Schaefer may have it right when he says the days are over when quality content was enough. You need amplification and it is the case that the large brands have reach and the money to amplify content. There is not a level playing field when it comes to amplification, although few of us hope or aim to get the millions of shares of the larger brands.I think there are things we can learn from examining widely shared content which can help us produce more shareable content ourselves but the content itself is not enough you do need an amplification strategy. Hey Steve, Recently had one my post that hit 4500 shares :(. Wish to a have a post that gets 1mn shares someday. Great Post. Thanks! Thanks, well done, 4,500 shares in our space is huge. Why do you think that particular post did so well? Thanks for your response. FYI, the post is called “Killer WordPress Checklist” http://capsicummediaworks.com/killer-wordpress-checklist/. It did well because we produced something that was not existing on the internet and there was Surprise Element to it. Spent a lot of time in coming up with it. It has now been downloaded more than 15000 times. So main take away is… Social is all about me. Babies. Love. Amusing Myself. How to make myself better. Grow more. Etc etc. That’s a death knell for brands. I don’t see Nike doing cat or baby videos. Social for brands is a dead end. If you search for Toyota and Bugger you will find a commercial that got something like 250k shares. Would love to agree with you about how awesome that is… but given that Nike’s audiences are possibly 50 million users a year from the 120,000,000 shoes they sell yearly (120 million stat from Nike’s Annual Report), the 500K is less than 1% of their customers. That’s not even bad. That’s really really bad. Not to mention that this is an AD, not a viral video and that 500K came after possible paid placements. This is why i’m saying Social is dead. It’s all about the person and their likes and interests. Brands are better off spending money elsewhere. That’s kind off the point. It is an ad. Created for TV (presumeably). However, they get an additional 500k views online. If they have paid for placement they will have got this in front of a much more targeted audience than when broadcast. No one would suggest that social is the only marketing channel but without clear figures it is impossible to say whether this was a success or not. The 120m shoes v 500k views is pretty irrelevant anyway. The only truly meaningful metric for any ad is how much profit does the ad provide compared to the cost of the ad. The information that you have shared will help many bloggers and internet marketers to drive traffic to their blogs and websites. I also feel that Key-Influencers play a huge role in any web-property’s success. Excellent work. I hope people realize that content that has the most shares is most likely being promoted using paid promotion on Facebook or LinkedIn and/or using influencers. No matter how brilliant and interesting content is, unless you can get it in front of enough people, it won’t have the opportunity to go viral. So first you have to create visual, compelling, interesting, useful content – and then you have to spend at least twice as much time promoting it as you spent creating it OR spend money to push it (have Facebook or influencers promote it for you). Great Post Steve. I am an up and coming blogger and I am working on developing my long-term content just like this. If you have any tips / tools to facilitate the process that would be awesome! Great information. I’m a song writer, and just finished a new dance/pop song about Donald Trump. Not a fan and it’s a controversial song. Hit the recording studio October 5th, for mixing, mastering and recording. Will be up on YouTube by October 10th. Here’s hoping controversy pays off in #’s. this article is very informative for me………….